SlotMusic is the name of a new music format launched by SanDisk with the support of the big four record labels: Sony, Warner, EMI, and Universal. 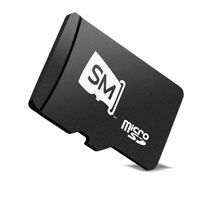 The DRM (Digital Rights Management) MP3 songs will be available on microSD cards by this Christmas. They will be played on devices capable of working with the new format, which will include computers from Apple Macs, to PCs and Linux along with mobile phones and PMPs. Notable features of the new format are 320kbps playback and all the bundled paraphernalia beloved of the vinyl generation from album art and notes to their modern equivalent, the music video. Users can also add content to the 1GB cards, which are packaged with small USB sleeves. "SlotMusic offers consumers an immediate, tangible, and high quality alternative to CDs and digital delivery," said Danielle Levitas, vice president, Consumer, Broadband & New Media, IDC. "This year, more than 1.2 billion mobile phones will ship globally, outstripping portable media players by nearly an order of magnitude - and this trend is accelerating." The card will initially be available in the US with those of us in the U of K and the rest of Europe to follow soon after. TechRadar will keep you up to date with pricing and more precise launch dates as they come.